The figure shows the difference between revenues and expenses for children charity in 2016. It is obviously that there the revenue is higher than expenses by about 340 million US $ leading to positive profit in financial statement. 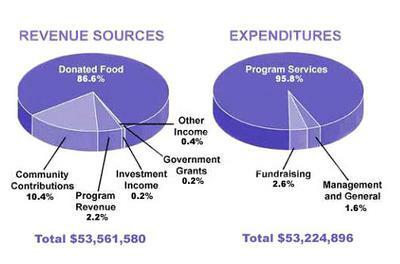 The figure illustrates that the most item consuming money is program services by 95.5 % on contrast the lowest one is management and general by 1.6 % while other expenses is payed for fundraising by 2.6%. It is also elicited from figure that the most revenues come from donated food providing about 86.6% of revenue and the successive item is community contributions by 10.4% while other revenue is submitted from different sources.